“Take out your application and reread it,” urged an endearing professor to our section of first year students at the Harvard Business School. We were less than a month into a two-year residence there. To a one we were humbled by the scope and pace required of us. At that moment we stood bleary-eyed and dejected. Her recommendation was intended to rekindle some sense of personal self-worth amidst a sea of upheaval. Did it work? Not sure any of us headed for our file cabinets but the sentiment was an elixir in its own right. I wonder if a similar activity could be called upon for transition? At 2+ years in….my transition could benefit from a re-read of its application. Why? I stand today amidst a bevy of in-flight experiments. All energize me. But something remains undone. Maybe I’m the type of person who needs unfinished business to maintain focus? Transition remains unfinished for me. My professional self is still a work in progress. Personally though I’ve covered a lot of ground. Thanks gratitude, courage & silence, curiosity and action. After a conversation this week I plan to add listening to this list. About a week ago a friend related to me a conversation he had with one of his mother’s doctors. “Do you know that your mother is quite negative?” said the doctor on a conference call late one evening. My friend like so many of us is spearheading care from a distance for his widowed mom. Once my friend heard this doctor’s remark he went into rationale mode, a detailed recounting of ‘why‘ his mother is so. “I wonder what that doctor was planning to say next?” I said to my friend. The thought hadn’t occurred to him. To me the doctor’s remarks sounded like a set up for a bigger conversation. Or perhaps a trial to gauge the sensitivity to a particular issue. After my friend’s lengthy monologue, however, the call had to proceed. The doctor’s comment floated in the ether, undeveloped. How often have I proceeded in this fashion? What could my friend have learned if he had simply asked, why? Are you listening? How many times have you asked why in the past week? I remember being chastised in my prior role for listening too much. Even then I would say I wasn’t listening all that clearly. The company I worked for was undergoing a period of significant change. Given this state leaders had tremendous opportunity to bring ideas forward to solve real problems. Great opportunity, right? I loved giving my team the runway to explore their ideas and make recommendations. This approach slowed down the cycle time to get to answers. Would it surprise you that I was criticized for this? One of my very vocal counterparts had a favorite saying…’let me tell you how we should think about this.’ Read: ‘My way is the only and best way. Your thoughts are irrelevant. Discussion not required.’ Ever wonder why this behavior is rewarded at the upper echelons in corporate America? I digress…. I’ve advanced my capacity to listen over the past few years. Because of it I’ve been introduced to great ideas, surprising feedback, sobering news and the full spectrum of emotions. Mostly I try to make sure I get to why in every conversation. I see parallels between the transition I went through as a new graduate student and the one that I am going through now. The first was characterized by listening carefully but not really hearing much. The second is characterized by far more expansive listening and a veritable symphony of hearing. Despite the interruptions I am wondering what is next? (c) 2012 NovoFemina.com – All rights reserved. No content on this site may be reused in any fashion without written permission from NovoFemina.com. 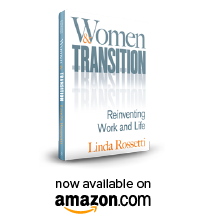 This entry was posted in Observations on Transition and tagged career transition, harvard business school, linda rossetti, observations from a women's transition, personal transition, transition, women's transition. Bookmark the permalink.